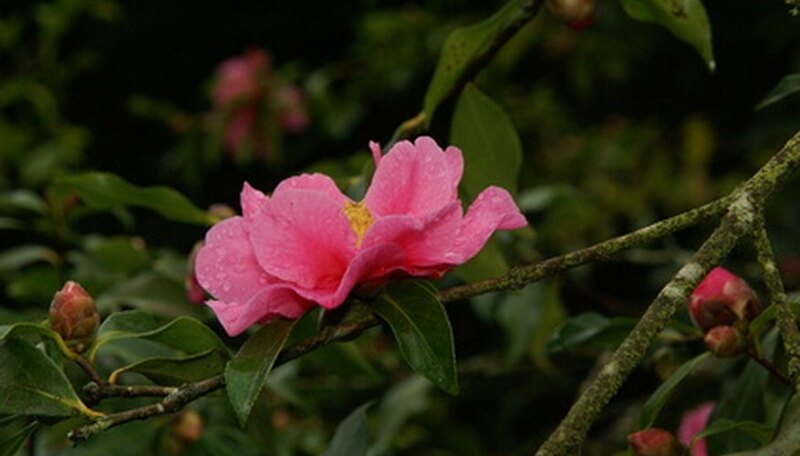 Camellia plants are susceptible to a variety of diseases caused by fungal infections, viruses and cultural problems. The best method of resistance is keeping your camellias as vigorous as possible through proper maintenance. Camellias thrive in shaded areas and prefer slightly acidic, well-draining soil rich in organic content. A 2- to 3-inch layer of mulch benefits camellias with increased moisture retention. Leaf gall disease of camellias is a fungal infection caused by the fungus Exobasidium camelliae. Generally appearing during spring growth of camellia plants, leaf gall causes the presence of malformed leaves and shoots that grow excessively large and thick, according to the Clemson University Extension. The light green leaf color changes to a pink or white hue, and the affected spots, called galls, open underneath leaf surfaces, releasing white spores; the galls turn brown and become hard. Though damage is usually only mild, control methods are available. For management, remove and destroy affected leaf parts, including leaves that have dropped from the plant, and keep camellias out of excessively moist shaded areas, as these sites provide an ideal environment for fungal growth. Additionally, if you fear your plant is highly susceptible, apply a preventive fungicide such as mancozeb at budbreak through June first every one to two weeks. Camellia yellow mottle is a virus of camellia plants spread by infected roots during propagation. Leaves take on a mottled appearance with a variety of abnormal, yellowed or spotted patterns; or, the green leaves may transform completely to a yellow hue. Flower blossoms display white spots when infected. Choose resistant cultivars and plant only healthy camellias as a control method; no chemical treatment cure is available. Oedema is a cultural problem caused by inappropriate environmental conditions. Oedema causes the incidence of an outbreak of bumps on leaf and stem surfaces, according to the Clemson University Extension. The bumps swell from small green/white spots into rust-hued formations with a spongy texture. Overwatering is the main cause of oedema. Diseased leaves suffer due to excessive water in the soil; roots given more water than the camellia can handle quickly absorb everything in their presence, and the leaves become inundated with water supply. For control, provide well-draining soil to your camellias and allow soil to dry out between waterings, particularly just after rainfall or if your climate is humid. Sunscald is caused by overexposure to the sun. Leaves appear burned with bronze colored areas covering parts of the plant that face the sun. As damaged or stressed plants are more vulnerable to infection by pathogens, a fungal infection may occur, causing leaf spot in addition to the sunscald. For control, plant camellias in the shaded areas they need or increase shade if sun exposure proves too extreme. Remove affected leaves, as they will not return to health.